Please include your banner or graphic and don't forget the link!! or that I (Bryan) thought might be helpful. anyone interested in Allis Chalmers!! It is favorite of ours!! The museum consists of three main buildings. parts and many lawn, garden and outdoor items. tractors from the 1914 10-18 to the D21. Plus two other barns with nearly 100 AC implements. a forum for "all colors"
very friendly group of folks!! fans of the "Johnny Poppers"
For our Farmall Cub Friends!! For Anyone who might want to travel through Oregon..
& DISTRIBUTORS AS WELL AS MANY OTHER SPECIALTY ELECTRICAL PARTS! 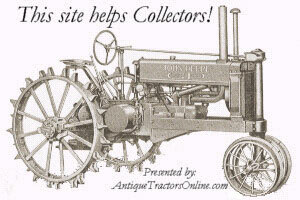 Fastrac an antique tractor support group and information site.